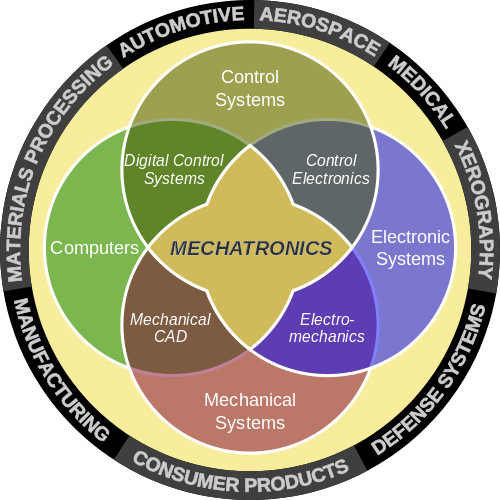 Mechatronics, is an emerging field in engineering which combines mechanical engineering, electronic engineering and computer science. It is centered on mechanics, electronics, computing, control engineering, molecular engineering (from nanochemistry and biology), and optical engineering, which is aimed at producing simpler, more economical, reliable and versatile systems. Mechatronics is one of the more recent developments in the engineering discipline that combines basic mechanical engineering problem-solving and design skills with the expertise of digital electronics and computer systems to develop modern products or to advance industrial systems through automation and the use of robotics. You can obtain Degree and National Technical Diplomas in Mechatronics in Sri Lanka. Advance Diploma in Mechatronics Technology (Full Time) conducted at Maradana College of Technology, Colombo 10 and Galle College of Technology. This gives NVQ Level 5 and 6 National Diploma. This is a two year full time course. Sri Lanka Diploma Course in MECHATRONICS NVQ 5&6 conducted by Technical College, Maradana. SLIIT is popular degree awarding institute approved by the University Grants Commission under the Universities Act. SLIIT is also a member of the Association of Commonwealth Universities. SUIT offers Bachelor’s and Master’s degrees in Computing, Business, and Engineering. SLIIT graduates are globally accepted in view of the high standards maintained. CINEC Maritime Campus – offers BEng (Hons) Mechatronics.